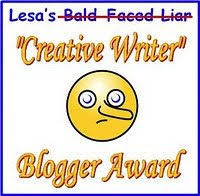 Kathy McIntosh at Well Placed Words gave me this award. Many thanks Kathy! I'm a tall, blonde and beautiful fitness instructor living in Sydney. I normally finish writing a 100,000-word crime novel a month.